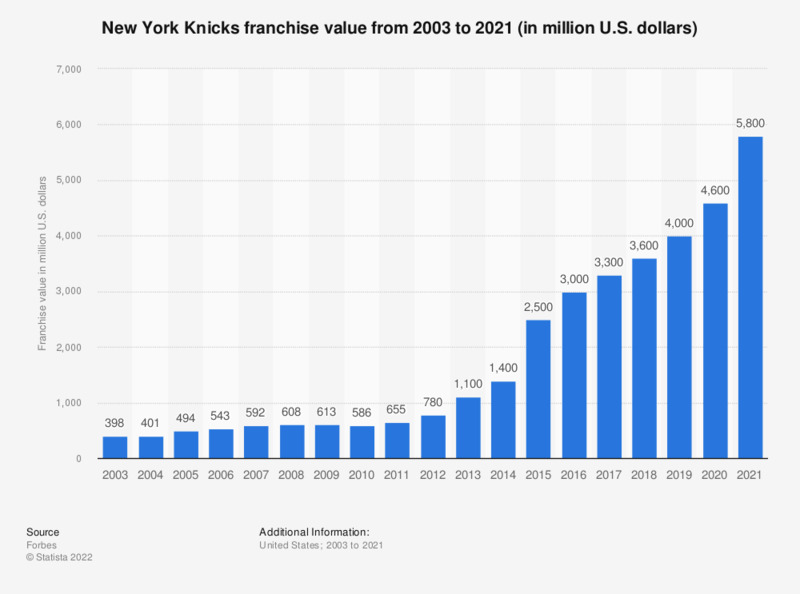 This graph depicts the franchise value of the New York Knicks of the National Basketball Association from 2003 to 2019. In 2019, the New York Knicks franchise had an estimated value of 4 billion U.S. dollars. The basketball team New York Knicks is part of the Eastern Conference of the National Basketball Association (NBA). The franchise was established in 1946 and was one of the founding members of the Basketball Association of America, which later became the NBA through a merger with the National Basketball League. Home games of the New York Knicks are played at the Madison Square Garden, which has a capacity of almost 20 thousand for basketball games. The team, as well as the arena, is owned by the Madison Square Garden Company, which also owns the WNBA’s New York Liberty basketball team and the New York Rangers of the National Hockey League. In 2019, the New York Knicks were assessed as the most valuable franchise of the NBA by Forbes with a total value of 4 billion U.S. dollars. The only other franchises valued at three billion or more were the Los Angeles Lakers and the Golden State Warriors. The average league-wide franchise value was at 1.9 billion U.S. dollars in 2019. For the 2017/18 season, the New York Knicks generated 443 million U.S. dollars in revenue. New York Knicks regular season games were attended by an average of 19 thousand spectators in the 2017/18 season. The total attendance was at more than 790 thousand. According to Team Marketing Report’s Fan Cost Index, the average ticket price for New York Knicks games was at almost 130 U.S. dollars, more than twice as high as the league-wide average ticket price, which was at 55.88 U.S. dollars in 2015/16. Statistics on "New York Knicks"